Child Dancing is a wonderful example of the insightful portraits for which Van Trump is most acclaimed. 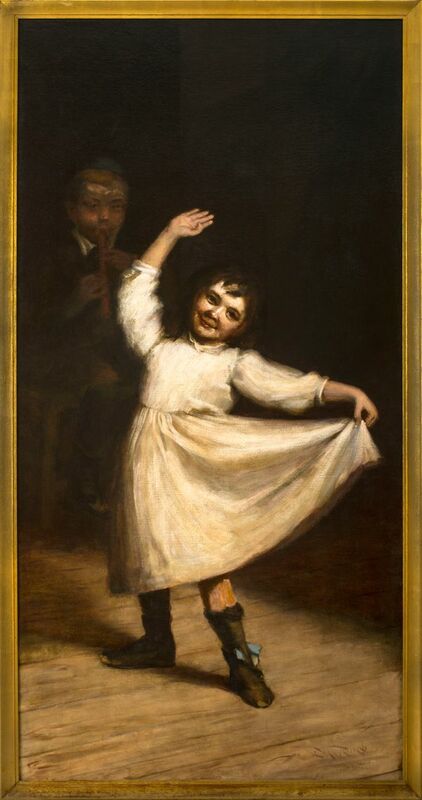 Here, she sensitively captures the innocence and frivolity of a little girl’s twirling dance as her companion plays the recorder behind her. Her direct gaze and sweeping arm gesture includes the viewer in her audience, for whom she delightedly performs while bathed in a bright spotlight. Her accompanist watches her while bathed in shadows offstage, his cheeks puffed out as he plays. This painting is a lovely representation of a playful childhood moment, the tenderness with which the artist depicts her subjects demonstrating why her portraits were so highly sought.